For the 9th year in a row, Hyundai was ranked #1 for customer loyalty among all automotive brands. 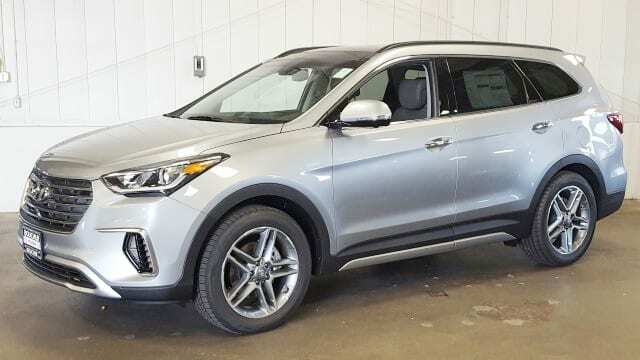 The engineers at Hyundai gave the 2019 Santa Fe XL the V6 power, roominess and versatility you want from a 3-row SUV. And whether you choose seating for 6 or 7 passengers, you’re protected by advanced safety systems like available Automatic Emergency Braking with Pedestrian Detection,2 Blind Spot Detection3 to name a few. But wait there’s more! The Santa Fe XL can carry three rows of people and their cargo while easily towing up to 5,000 lbs., thanks to a 290-hp V6 that’s one of the most powerful engines in its class. With Hillstart Assist Control and Downhill Brake Control, it knows how to keep you poised under pressure, too. Whether you choose seating for up to seven or 2nd-row captain’s chairs with seating for up to six passengers, Santa Fe XL is where luxury lives. Step inside a leather-clad Limited Ultimate model, and you’re greeted by the rich character of its premium wood-finish interior accents. Secure yourself into the leather driver’s seat and reach for the warmth of a heated steering wheel. Seat controls at your fingertips activate an Integrated Memory System, power lumbar support and soothing heat or cooling ventilation. Heated and reclining 2nd-row seats are onboard as well. Third Row passengers are people too, so Hyundai did not forget about their need to be entertained. So that’s why Santa Fe XL is available with a 3rd row USB outlet to keep those electronic devices charged up when you’re on the road.